Back up and Restore to/from local and external hard drivers, network locations, removable devices (USB sticks), CDs/DVDs and FTP locations. Synchronization of files and folders between two locations. If you want to see the complete list of features, click here. The installation process is very simple and straightforward and it does not install any additional software such as annoying toolbars, trial versions of other applications, as other free applications do. GFI Backup 2009 Home Edition has a very intuitive interface. Once you start the tool, you will see big shortcuts towards the main functions. All the tasks are done by following specific wizards which are easy to understand and configure. Another big plus is the fact that you have a link towards the support forums in the upper menu. You just click on it and you can start writing your questions about this tool. The application does what it advertises. All functions work without problems and they can be easily configured to meet your needs, as specific as they might be. One feature I really enjoyed is the fact that GFI Backup 2009 Home Edition allows you to backup user settings for different applications such as audio and video players, internet browsers, instant messengers, system utilities, etc. Even though the list is predefined and it is not very long, it can help a lot. Restoring files is as easy as backing them up. I did encounter a small glitch when restoring some files and settings but it was easily fixed. I'll give more details about it in the section below. During one of the restore tests, I encountered an issue where GFI Backup 2009 Home Edition could not restore my files. The files in question were system files and because GFI Backup 2009 Home Edition runs as a normal user, without any administrative permissions, it could not restore them. The fix is to start the tool as an administrator, by right-clicking on its shortcut and selecting Run as administrator. Considering the fact that many users will want to backup and restore files which are protected by Windows Vista, it would be a good idea to have GFI Backup 2009 Home Edition always run as an administrator, or to automatically request the elevation of permissions when needed. The fact that GFI Backup 2009 Home Edition allows you to save user settings for certain applications is really useful. However, it would be great if this list would be extended to include more application such as Office suites (Microsoft Office 2003, 2007, OpenOffice, etc) or additional browsers such as Safari or Chrome. Also, regarding Firefox, GFI Backup 2009 Home Edition backs up bookmarks, browsing history and user settings. However, it does not backup installed extensions or search engines. It would be very nice if future updates of GFI Backup 2009 Home Edition will do this. An easy backup and restore process of all browser extensions is really useful. 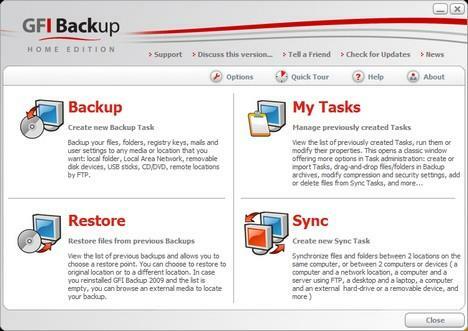 GFI Backup 2009 Home Edition is a great free tool with no major flaws. It does a very good job at backing up and restoring your files and folders and works on all versions of Windows Vista. I've tested it on the upcoming version of Windows 7 and it works there as well. If you want to download it and give it a try, click here. Data is the most precious thing in the computer and we often reflects carelessness towards it.GFI Backup is an awesome and free tool to backup and recover your data. There was mention in the post the restore was unable to restore some system files due to administrator access not being present. Did subsequent restore attempts succeed? Was the vista system fully functional after a restore? A little more detail on the restore process and how it was tested, ie, a new drive was installed into the computer or the drive was wiped, steps toward making the wiped hard drive or new hard drive in the system capable of starting and running the restore process would be handy. I stumbled upon this post but I'm glad I did. GFI makes some other very useful and productive software applications and I was somewhat surprised to read that the GFI backup is free. I cannot think of a reason why Microsoft left out the capability of backing up the entire system out of the home versions of vista except perhaps to enable companies like GFI to make inroads to the market. "GFI Backup 2009 Home Edition is a great free tool with no major flaws." Not what I found. It has major flaws. One is the placement of the backup. It seems to want to just randomly place the folders where you ask it to, sometimes putting %COMPUTERNAME in front of the directory, other times, it won't.